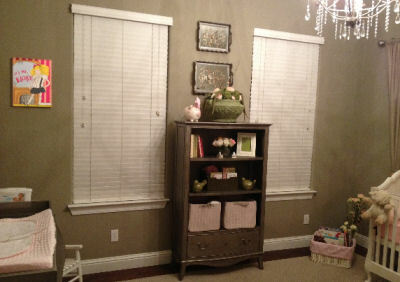 Ellie's nursery is a delight in baby girl pink, greige (a combination of gray and beige), and moss green. I designed Ellie's romantic vintage nursery to be an oasis of sweet softness featuring a color palette reminiscent of gentler times long past. Baby will be warm and cozy wrapped in an ivory, crocheted baby blanket made by her Aunt Carol. The drapes that frame the crib were made by Ellie's grandmother, Jackie, using material with a burlap-like weave that was purchased at the "Quilters Paradise" fabric store. Monica made the cute, curtain tiebacks with notions found at the same place. The above nursery pictures were made by newborn baby photographer Cori Derksen of Fresno, California who did a lovely job of capturing the vision of designer, Monica Calles of Interior Designs by Monica Calles, also of Fresno. Below are some pictures mom took to show us some more details. With one quick trip to Bed, Bath and Beyond to buy nursery curtain rods they were perfectly hung in place on each side of the baby's Pottery Barn crib. The dresser, glider, bookshelf and nursery chandelier from Restoration Hardware Baby have a timeless look that will grow with Ellie and be used for many years. 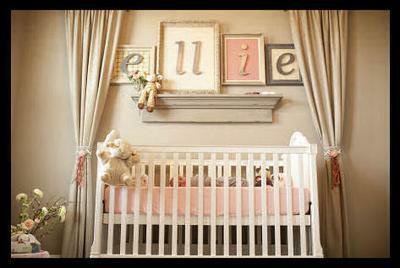 Mom and her talented friend, Monica, chose the material and frames for the letters above the crib the spell Ellie's name. While shopping at a local store, "J's too", the ladies found handmade letters to hang above crib. Sadly, they didn't have letters in sizes they needed in stock. However, J's saved the day by giving them the name of the artist who was happy to help create the letters for Ellie. Access to this resource allowed mom and Monica to design several one-of-a-kind wall arrangements using a selection of antique frames, material for the background and iron letters in a variety of sizes and colors. Their choices add a pop of color to the neutral wall paint color, Garden Wall by Behr 730-D. Elisa told me that she chose this color over the others that Monica gave her to pick from because it reminds her of a Wendy’s frosty! I tell my visitors that stop by Unique Baby Gear Ideas that are experiencing problems with their projects to "decorate with what you love" so this tidbit of information made my heart sing and provided an important clue as to why all aspects of Ellie's romantic, vintage nursery came together so well. The shelves of this shadowbox are filled with delicate items including a framed silhouette of Elisa and Matt. The location of the piece ensures that Ellie always has her momma and daddy watching over her. There are many items that give the space character. Some of the decorations came from Home Goods but their modern appearance was balanced with antique store finds like the 110 year old, wooden shutters above the changing table. One of Elisa's favorite decorations in the room is a hand painted picture that says: "It’s me, Eloise". Elisa's friend, Alley, created this colorful, personalized painting just for Eloise (Ellie). More decorations made by special people in this baby girl's life include the "Ellie" blocks and a frame received as a gift from one of Elisa's best friends that was ordered from Etsy and personalized with her name and words from the book "Brown Bear". As you see in the photo, there is a wicker basket decorated with silk flowers to the left of the crib used organize all of the books received at the baby shower, hosted by Elisa's sister, Jennier. Her sister asked that guests buy Eloise a book and leave a note and their signature on the inside cover rather than buying cards. This thoughtful idea added lots of books with sweet messages that can be kept and enjoyed for a lifetime to the nursery library. Thanks to Cori Derksen for allowing us to share her amazing work. If you are near Fresno and are looking for a photographer you can contact her via her website and if, like me, you are thousands of miles away treat yourself to a break and visit her photo gallery. If you are located in the area and need help with a decorating project, Monica of Interior Designs by Monica Calles would be my first recommendation. She can be contacted by phone at 559-978-49four3 or by email monicacalles49 at hotmail.com. 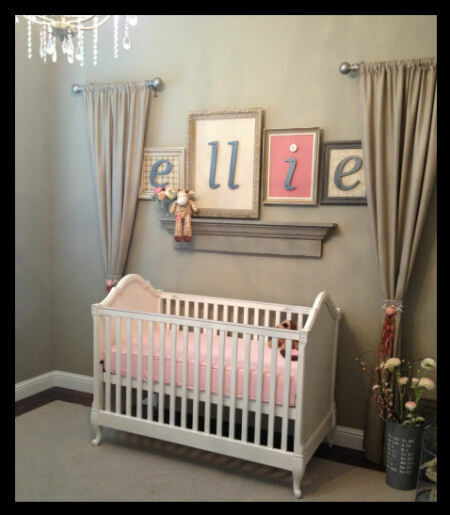 I hope that you have enjoyed the tour of Ellie's romantic vintage nursery and that you will leave a comment to let Mom know how much you enjoyed her baby girl's nursery pictures. 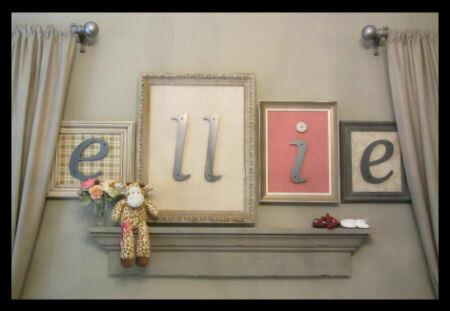 Hi, what size are the frames you used to frame the letters that spell out "Ellie"? Romance is especially wonderful when it is achieved without overspending. You really accomplished a lot for the amount of money spent decorating Ellie's room; way to go! Where did you find the metal letters? Any ideas on how she connected the letters to the frames?? 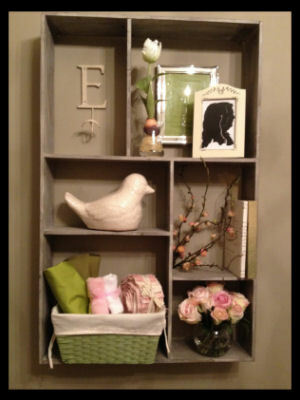 Ellie's nursery is beautiful & we'll enjoy using some of these ideas! What a beautiful, calming, and peaceful nursery. It will certainly be a room of sweet dreams. What a wonderful dream & play place for a beautiful little girl to grow up in. Any little girl would love to have this special place to call her own. The Sweetest Ever! It is perfect for this little angel. The color is awesome! awesome design. great color choices. inspirational. Perfect nursery for a perfect baby girl!! I've been in Ellie's nursery and it is as stunning in person as it is in the pictures!!! I love the room and the baby girl it was designed for. Wow what an amazing design. It had a very classic and warm feel. I'm very inspired by this new color Greige. I will need to try this color out in my painting studio. A very special room for a very special girl. Hugs and kisses to you miss Ellie. I love Ellie's room, especially how the colors go together... a delicate, feminine, designer quality. All the people who worked to put this together are so creative, and they did a wonderful job! Ellie is a very special girl. Ellies room is amazing, even more beautiful in person. It was well planned out with love for her, the only thing more beautiful than her room is Ellie and her Mom Elisa. Put the 3 together and you have perfection! LOVE this room. The color combination is beautiful. Ellie is one lucky little girl. Ellie and her room are wonderful! I love this room. It is a blend of new and old "vintage". The room shows how there was thought behind every decision. It does not look like something out of a magazine designed for a "baby star", it was designed for a very blessed baby whose mommy wanted her to know how special she is! It is so personal! This nursery is definitely a winner, hands down. This nursery is way to cute!!! Beautiful room for a beautiful baby! This nursery is so cute! Love it! 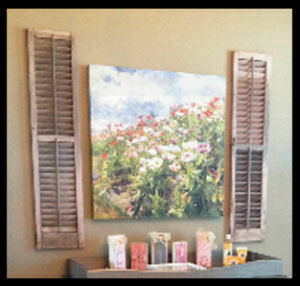 Soft, romantic decor draws you back to a more gentle and relaxed time. Victorian Romance is beautiful. So amazing and the best part is that all of her friends and family added their creativity and personal touches! This room is so adorable, wish I had a room like that as a baby girl, or shoot even as an adult!! Perfect blend of soft and strong colors and textures. A warm and inviting room! I vote for Ellie's Room! Perfect blend of old and new and soft and strong. Ellie's room is a haven for her and anyone tending to her! It's hard to say what the best part of this room is, i.e., pictures, blocks, etc., but the amazing part to me are the color combinations and the shades and how they all blend together. This room is a masterpiece. How could it be any better for the best baby in the world? I love Ellie's nursery! It's just perfect!!! I vote for Ellie's nursery. 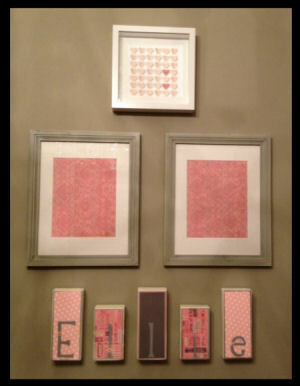 I absolutely LOVEEEE the framed letters in different sizes and patterns! Great job Ellie's mom! !